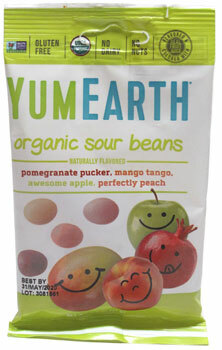 These tasty little sour jellybeans are packed with mouth-puckering flavor and contain 100% of your daily Vitamin C in each serving! Made without high-fructose corn syrup and other artificial sweeteners, these sweets are also free of gluten, soy, peanuts, tree nuts, artificial colors and flavors, too! 2.5 oz. (71g) package is $1.99. From Glen Boisseau Becker of Harmony, Florida on 11/8/2014 . I enjoy these, and milady (who has more of a sweet tooth but is choosy enough that she doesn't want anything TOO sweet) positively loves these citrus-flavored jelly beans. If she has some handy in the car, a small handful is enough to satisfy her cravings when she can hardly wait till dinnertime but doesn't have time to stop for a meal. From susanna of Orlando, Florida on 5/12/2014 . I love them. I'm a sour candy fanatic and buy these when ever I get the chance. From Anonymous of Calgary, Alberta on 2/20/2013 . These little gems are a big hit in our family. The bursts of flavour are quite delicious. From Anonymous of Metro DC, District of Columbia on 9/6/2012 . Be more specific with the ingredients please! I would like to know which so that I may either purchase of avoid. I am allergic to corn. I can eat tapioca or rice. Please encourage the manufacturer to identify what the product specifically contains. From Zoe of Baltimore, Maryland on 3/21/2012 . The sour coating on these is pretty intense and can overpower the individual flavors. Turns out that's not such a bad thing - all of the flavors tasted like minor variations on generic citrus. They're certainly not terrible but I wouldn't recommend them.